Khin Phyo, 23, and her baby survived thanks to the UNFPA-supported health volunteer’s decision to take her to hospital. RAKHINE, Myanmar - Khin Phyo, 23, expected to give birth at home with help of a traditional birth assistant. That is how most women in Myanmar’s poor and crisis-ridden Rakhine State give birth. She had received a clean delivery kit from the UNFPA mobile clinic where she went for antenatal visits, and she was not too worried. But as the labour dragged on into a second day, Khin Phyo’s spirits sank. 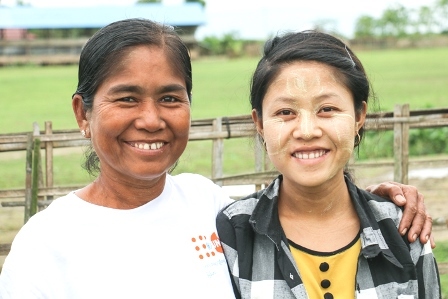 When the UNFPA-supported health volunteer in her village heard what was happening, she rushed to Khin Phyo’s house. “She had been in obstructed labour for well over 12 hours. This is a clear danger sign in labour. I learned this in my training. I tried to convince the family to take her to hospital”, says Eaint San Phyo. But the family wanted to wait. The cost of hospital care is a major barrier for women in Myanmar who suffer pregnancy and childbirth complications. Rural women in poor and underserviced parts of the country, such as Rakhine, are most vulnerable. For every 100,000 births in Rakhine, 314 women die. This is one of the highest incidences of maternal death in a country that, as a whole, already has the second-highest maternal mortality ratio in Southeast Asia. To help combat maternal death in Rakhine, UNFPA runs two mobile health clinics that focus exclusively on women’s sexual and reproductive health and rights. At a time when Rakhine is torn apart by violence, and nearly 700,000 people who identify as Rohingya have fled to neighbouring Bangladesh, UNFPA brings maternal healthcare to women in Rakhine based on their needs, regardless of ethnicity. The decisive action during a complicated birth by UNFPA-supported health volunteer Eaint San Phyo, saved 23-year-old Khin Phyo’s life. The two mobile clinics serve the rural area around Sittwe: One operates in camps and villages where people who identify as Rohingya are confined, one operates in villages where women who identify as Rakhine live. And both clinics are supported by local health volunteers in villages and camps. Eaint San Phyo, 50 years old and the mother of five grown-up boys, has all the characteristics UNFPA looks for when recruiting health volunteers: She is clever, committed and caring. And because she has lived for 50 years among the people she serves, she knows the situation of all expecting and new mothers in the area. Though she cannot take the place of a skilled midwife, her UNFPA-funded training enables her to play a pivotal role for safe motherhood in her village. At that point, finally, the family agreed, and Eaint San Phyo hurried to organize transport. She then accompanied Khin Phyo to the hospital, where the young mother underwent an emergency caesarean. Khin Phyo lived, and so did her baby. Today both mother and her family are grateful to Eaint San Phyo for helping the family make the difficult decision to send their daughter to hospital. In 2018, UNFPA and its partner the Myanmar Medical Association have recruited, trained and deployed 74 health volunteers that support safe motherhood and sexual and reproductive health and rights in Rakhine in both Buddhist and Muslim communities. The mobile health clinics are funded by UNFPA with support from the Myanmar Humanitarian Fund, and are operated by the Myanmar Medical Association.